Angie To was born in Hong Kong and emigrated to Canada in 1976 . She received her Diploma of Fine Art from the Alberta College of Art and Design in Calgary and her MFA from the Ohio State University, Columbus, Ohio. Her paintings are derived from a close observation of natural ephemera such as cloud formations, shadow and the play of color and light on surface. 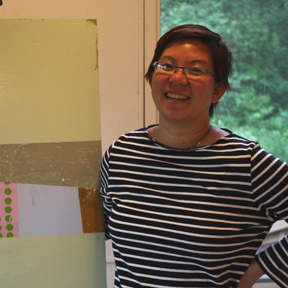 She has exhibited in Canada and the United States and currently maintains a studio in upstate, NY where she is a professor of art at Alfred University.